Blog Are You In Denial? Are you living in denial when you think about your domain name portfolio? Let’s find out. Denial is a powerful behavior. It can make you do things that are illogical. Like wasting money year after year on domain names that have no value because you think a buyer will finally come along. Most investors will keep a domain name for years. Let’s just say 10 years for a round number. And in the best case scenario, they have special pricing like the Domain Discount Club at GoDaddy, where you can buy .com domains for $8.47. With tax it’s $9.21 for me in Seattle, Washington. Year 1, your total cost of ownership of that one domain name is $9.21. Year 2, it’s $9.21 for the first year plus $9.21 for the second year, or $18.42 total cost of ownership. Year 3, it’s $9.21 for the third year, plus years 1 and 2, or $27.63. We continue onward. Year 10, we have $92.10 into this domain name — if it hasn’t sold. Now, $100 is workable by most investors. The problem is that most investors don’t know when to say *enough* — because denial keeps them buying domain names that have no value. So they add 9 more domains and their total cost of ownership is now $921. And they add 40 more domain names and their total cost of ownership becomes $4,605. Heck, I know people who have hundreds in their portfolio where only a few of them are good, salable domains. Let’s say they have 450 valueless domains, their total cost of ownership is $41,445. It’s hard to imagine wasting $41,000 but it happens because they get a sale here and there — and they trick themselves into thinking that maybe they’re cash flow positive. 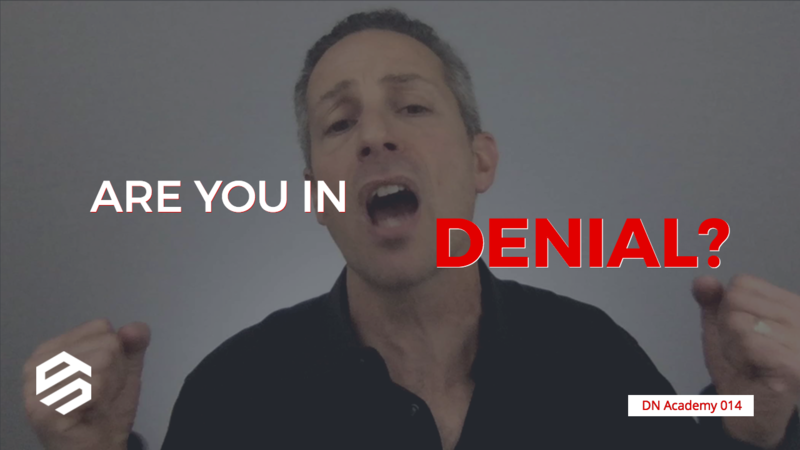 But denial keeps them from realizing that they could be $41,000 more cash flow positive if they got rid of their junk domains by selling them wholesale at NameJet, GoDaddy or NamePros, or dropping them at their next expiration date. GoDaddy charges $10 per year in whois privacy and if you are silly enough to hide your contact information from potential buyers, that could drive your total cost of ownership up to $86,445. Use the calculator below this video or follow the link to use the calculator on DNAcademy. Do an annual portfolio review, and face the facts. If your domains aren’t receiving inquiries or traffic year after year, and you don’t think that a domain name is in a burgeoning industry like recreational marijuana or consumer solar panels, then drop it and save the cash for better domain names. Deals like this are always around the corner. Save your money, be diligent about investing in domains with a clear commercial purpose, and focus on upgrading your domain name investing portfolio slowly over time. Thank you so much for this valuable video!!! It is a true reality check! Glad you found benefit, Cathy. Thanks for posting a comment. I appreciate the feedback. Great example of how numbers compound quickly. And it’s easy to be in denial when you form a hypothesis (e.g. “I think these types of domains are selling well, so I’ll invest in them.”) and then forget to revisit 6 or 12 months down the road about whether the data (i.e., your personal sales or general sales in the industry) supports your decision. We’re all guilty of that denial to some degree. I’d love to hear how you look at your portfolio and review whether you want to drop or keep your names, Michael. Thanks for this valuable video. I have a lesson planned in this area. Thanks for your request, Michael. Thanks for posting a comment, Julio. Great advice! Thanks again Michael for all you do!! Thanks for watching and taking a moment to post a comment, Carl. It’s much appreciated! “Clear commercial purpose” that’s what I’ve always based my domains on, I don’t consider myself an investor but have sold a few domains over the years, still wouldn’t, dare try to make this a career or even see it as a side hustle. The majority of the time I’ve bought with the intention of developing these sites myself. Kudos to those that have made successful careers out of this, truly admire that. You having intention to develop a business in the future is a good indication that others will as well, provided you actually have the skills to do so and aren’t just kidding yourself (that last part is meant for other investors, not developers and business owners). Most of the domains I want to buy — where I reach out to end users to inquire about purchasing — are in that same category. As a side benefit to the owner, it actually makes me spend a little more to acquire them. I renew my domains on a monthly basis. I few months ago I made the decision that I was was going to drop 10% of domains every month. It is not always easy to choose which ones (sometimes it is 🙂 , but it is an important trimming process that frees up funds to invest in higher quality domains. I maintain an excel of my own which tracks the purchase price, renewal amounts, number of renewals (to tell me how many months I had money that wasn’t liquid) & sale price to give me an interest-adjusted final price 🙂 That shows me my actual profit is atleast 20-25% lower than what it looks like on the surface! Great job, Gaurav. That’s exactly what we propose at Efty.com, but clearly you can do it yourself in Excel too. As you point out — without proper tracking — it’s easy to forgot to add a commission, forget about renewals, etc. and make your profit look higher than it is in reality. How did you get those Namejet names from the expiring lists? I don’t know how to filter to get the best and relevant names from lists. Do you use a software or site to get the drops daily? The sales described at 2 minutes 50 seconds in the video above were recent sales at NameJet over the past year. NameJet is typically only frequented by investors, so I wanted to show good domains that you could have purchased at good prices. The way I find this information is on NameBio.com. No numbers (only investors), no hyphens (usually terrible domains to purchase), five characters or more (eliminates 3 and 4 character acronyms). I would be great if you could add the ability to be notified when there is a new comment in a thread that I am participating in and/or watching. Could you tell me how to filter the best names or get 1/2 word relevant names from the pending delete list? “Filter the best names” is a subjective endeavor. I find the best names to be generic keywords like Amazon or Jet, but they almost never expire as they’ll be auctioned off before that happens. In DNAcademy I teach students how to use ExpiredDomains.net, which is a free equivalent to Dropping.com and FreshDrop.com. But in order to use it effectively, you need to figure out what type of domain names you want to invest in (e.g., generic keywords, exact-match keywords, brandables, acronyms, numerics or alphanumerics). Only then can you start to set criteria to search against using any of these tools. It’s like saying, “Michael — what type of stocks should I invest in?” It all depends on your budget, investing horizon, appetite for risk, desired yield, etc. Domain name investing is very similar.